I want to mention as well that my observations … my conclusions .. are to be taken very lightly as I am in no way an expert in anything we visit. I am quick to pass judgement and to form opinions but I realize that these opinions and conclusions can be flawed as it would take months or years of living in an area to truly understand what is happening around you. This being said, I will now continue. I am about a week late with my journal .. We are currently sitting in the “entertainment deck” of Changi International Airport in Singapore.. This airport is rated one of the best in the world and we now know why … it’s a full mall with all sorts of …conveniences. The entertainment deck, for example, features a music listening lounge, a small theater area with a movies playing, an online gaming room with computers and preloaded LAN games, some arcade / console booths with more games, a cafe with fast food and beer. There is a museum somewhere .. miniature parks with plants and fish ponds .. every store imaginable .. restaurants, bars and even a couple hotels .. there are lounges with spas and rooms to rent by the hour if you just want to have a nap. It’s midnight right now .. we are waiting for our flight at 7:00 am tomorrow morning .. and we are not bored. My point being, we aren’t in Vietnam anymore .. and wow .. what an experience. It was one of the most incredible places we have ever been but it was also THE most challenging place as well. And people who have been here will tell you this … and the guide books will tell you this .. and the internet forums we read told us this. But they all failed to communicate this point clearly. I will clear it all up for everyone. When people say “Traveling in Vietnam is very challenging and difficult” what they truly mean to say is “The Vietnamese don’t speak English” … “Oh, and they don’t like foreigners”. These 2 facts make Vietnam a super challenge !! You can’t ask anyone anything meaningful .. you must limit your questions to 1 word destinations and be content with a nod, a pointing of a direction or a no .. Example : “ Timmins ? “ … response : “Yes” and pointing north .. You cannot ask “Will Timmins be cold ?” or “Can I go fishing in Timmins ?” or “Is there a mall in Timmins ?”. I am using a basic example to make my point .. and perhaps, others who have been to Vietnam will challenge my point of view .. but I would say they have friends in that country or they have connections of some sort. But doing the DIY thing and knowing absolutely no one, this is how it is. Throw in the fact that they can’t stand foreigners, and you are pretty much working a full time job on your “holiday” just trying to find places and do activities. Please don’t misunderstand me, on a scale of 1 to 10, the past 2 weeks were a 9.5 for sure … awesome time ! We just had to work very very hard to have this awesome time. About them not liking us .. it makes sense with all the wars they have been fighting for so long. The last straw being the American war .. but before that was 10 years of fighting the French to take back their country .. and before that 100 years of French occupation .. then pepper in countless battles and wars with the Chinese dating back over 1000 years .. The Vietnamese have been fighting to keep their country .. forever ! They are tired of it and they don’t ever want to be in that position again. They see foreigners, and they must think “ MY country, get out of my way” .. and this is proven every 2-3 minutes as you walk down the street .. every 2-3 minutes a scooter wants to drive through the 1 foot area you are standing in or walking through at that moment .. or a person will walk in front of you, seemingly for no reason other than to make you have to stop or hesitate. For every smile you get, there are 10 frowns and looks of disapproval. We have been lied to I don’t know how many times .. we have been swindled at least 10 times .. this continued right up to 2 hours ago here in Changi Airport when we realized we were not able to check in the transit area as we were told by the ticket agent in Vietnam .. that guy lied to us ..lol .. one final punch to the gut from 3000 km away. That guy is laughing right now.. he knew we couldn’t do this check in, yet sent us packing anyhow. An hour before that, we ordered a meal at the Hanoi Airport and she brought us our dirty burgers and fries with 7 ups .. We didn’t ask for 7 up .. I told her we didn’t want 7up, we preferred a Pepsi or Coke. And of course, no, we were not allowed to have Pepsi with our meal .. lol. Seriously ??? You are going to force us to have 7up just because you feel like giving us a hard time ? Lol .. It was against the rules and she couldn’t give us Pepsi .. well, after 2 weeks of this crap I knew better .. I looked at the coworkers and sternly said I wanted 2 Pepsi instead please .. we paid you for this meal .. blah blah .. we got our proper drinks. 2 hours before that, a man stopped me on the street and took my sandal off my foot and started pouring glue in the seems .. and before I could stop him, he had a large shoe needle and was drilling holes in my nice comfortable sandals I bought in Canada .. he was sewing straps in place to make them more solid .. I couldn’t believe it and it was too late to stop him. He may as well finish … after that he started gluing a chunk of rubber on the heel to make a new heel .. for my sandal !! He then wanted 300,000 Dong for this .. you can rent a hotel room for 300,000 Dong .. I was fuming .. I grabbed my 1 sandal with all the alterations, gave him 100,000 Dong and walked off as he kept haggling to do my second sandal .. I ripped off the new heel taking precious rubber away in the process .. geezus !! I can go on and on.. struggles and challenges.. They really don’t like us. And every foreigner we spoke with in the last 2 weeks reported much of the same .. That the Vietnamese are so rude to them and that they have worked hard at avoiding being scammed or ripped off. 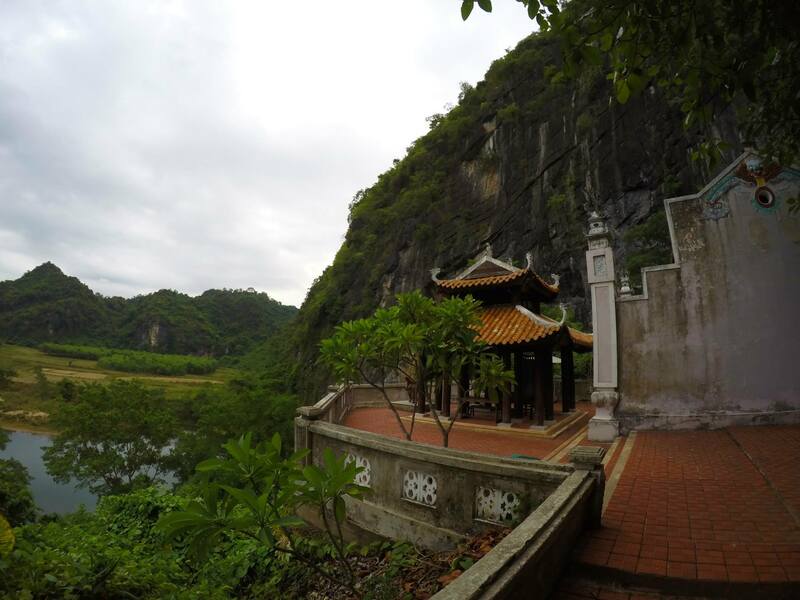 Of course, there are exceptions, and we met a few very nice Vietnamese people along the way. All that being said, it should set the tone for everything else that happens. We booked a sleeper bus through this “nice” lady at one of the various travel kiosks. Challenging this was ..The sleeper bus has 3 rows of lazyboy type “beds” .. stacked 2 high. Sylvie was right at home .. At 5 ’11 I did not fit. These buses were designed for Asians .. not for … non Asians ? There are people much taller and larger than I right ? So if I didn’t fit .. These buses weren’t intended for us. What a horrible ride .. enough about that. We toured one of the most beautiful places we have ever seen .. Huge “karsts” everywhere .. which are small mountains/cliffs that jut out of the earth .. with green jungle covering them .. rivers, fields and cliffs .. A crazy winding road going around these giant land formations. Amazing ..
We stopped in at the river and booked a boat that took us into the Phong Nha cave … an awesome ride through a very large cave with weird shapes along the surface .. The pictures can speak for themselves. We then drove on deeper in the park and went to a cave called “Paradise Cave” and holy comoly … a mega cave !! 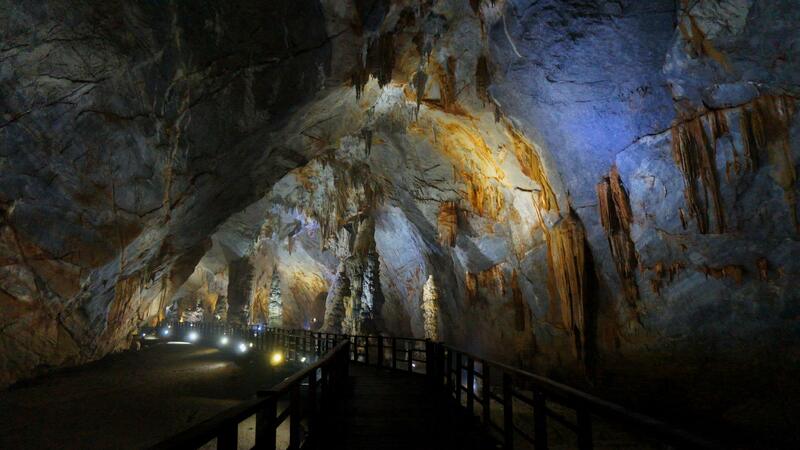 We read that it is one of the largest dry caves in the world .. Humongous. It starts with a difficult climb up the side of the karst that it is located inside, and then a wild staircase leading down into the depths of this cave that you would only see in the movies. It was almost cold inside which was a nice relief for a few hours .. We walked right to the end taking probably 100 pictures that didn’t turn out .. Have yet to learn taking proper photographs in the dark. An incredible place ..
What a great day .. The landscape was everything .. and the caves of course. Words can’t describe the scenery and feel of the place. There were very few tourist which made it all the better.. when we were on the scooter, we had mother nature all to ourselves. A few of the caves were only recently discovered and also only recently opened to the public. So Phong Nha is in development mode .. Our hotel was brand new .. everything made of shiny stone .. new furniture .. LED tvs in every room .. high tech hot water tanks .. new everything. And very few customers. 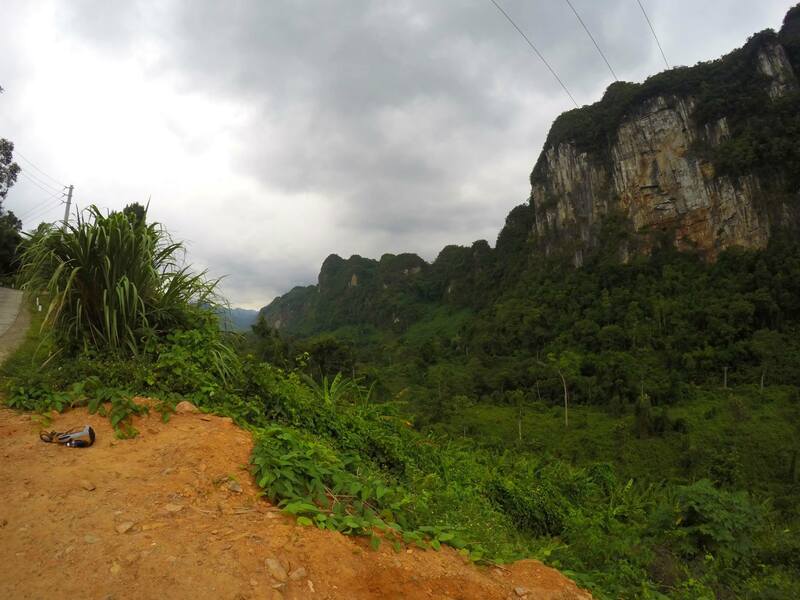 The hotel owner is obviously planning ahead as he knows in the next few years Phong Nha is going to boom. If it wasn’t for the fact that Vietnamese don’t want us there, this would be an excellent contender for investment .. I can’t say it enough, what a beautiful place on earth.